Twice a year the Tractor Supply Company sells Paper Clovers for $1 at all of their stores. The proceeds go to each store's local county 4-H program and is used to help youth go to 4-H camps and leadership conferences. Recently, several San Joaquin 4-H members have benefited from full scholarships funded by the paper clover campaign to Central Youth Summit, the California 4-H Camping Conference, and 4-H Summer Camp. The money can also be used for events like the 4-H State Leadership Conference, California Focus, and Washington Focus. Please encourage your friends and family to purchase a paper clover the next time they are at Tractor Supply. 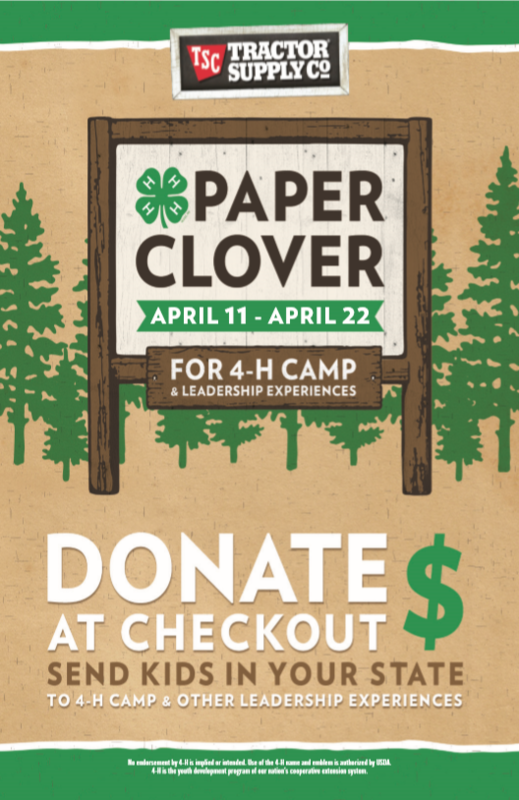 Each clover makes it that much easier for our members to participate in leadership and camping experiences!